This giveaway that offers the PC edition of the popular action-adventure video game Watch Dogs to all Uplay users starts tomorrow and ends on November 13. However, those in a hurry can already preload the game, but they will have to wait until tomorrow to play it. Ubisoft's Watch Dogs (stylized as WATCH_DOGS) was released at the end of May 2014 for Microsoft Windows, PlayStation 3 and PlayStation 4, Xbox 360 and Xbox One, while the version for the Wii U console arrived later the same year, in November. By the beginning of 2015, it shipped more than 10 million copies. Now, PC gamers who somehow skipped playing this popular action-adventure video game so far can grab it for free thanks to Ubisoft's latest giveaway, apparently a first taste of what's to come this Holiday Season. Earlier today, I got an email from the Ubisoft Club that simply says "To start the Holiday Season, Ubisoft is happy to offer you Watch_Dogs for free on PC. Stay tuned for more surprises!" and nothing more. Since I had Uplay installed on my PC already, I just opened Ubisoft's client and added the game to my collection. The good part is that, while the giveaway begins in a few hours, the game can be already preloaded, but can only be enjoyed starting tomorrow. 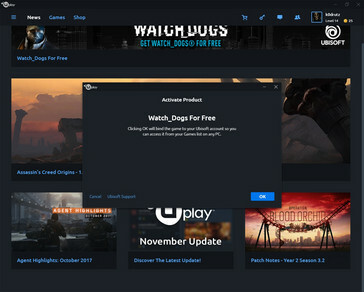 Those who do not have an Uplay account yet should register (it is free, obviously), download the client, log in, and then add the game to their account. These steps must be completed by November 13 at 5 PM. Once this period ends, those who took advantage of this deal will get to keep the game in their library (and play it, obviously) forever. Unfortunately, the deal above only gives us the base game. 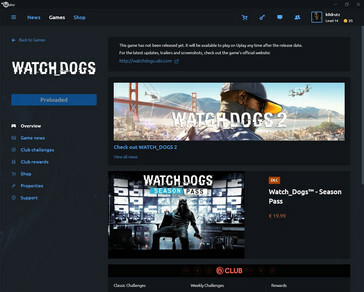 The season pass that comes with a new single-player campaign and other goodies must be purchased, but it has a reasonable price of US$19.99. 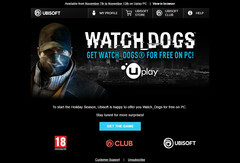 Watch Dogs for PC only supports 64-bit operating systems, starting with Windows Vista SP2. Today's average gaming PC should have no problems running it, in case you were wondering. The list of minimum system requirements includes the Intel Core 2 Quad Q8400 processor or AMD's Phenom II X4 940, 6 GB RAM, and the NVIDIA GeForce GFX 460 or the AMD Radeon HD 5770 graphics cards. The PC version of this game requires about 14 GB of space and quite a few hours to spare after the download is complete, so go ahead and enjoy it!